Stompin’ Tom Connors (1936-2013) is a Canadian singer-songwriter legend, whose iconic The Hockey Song is played as an anthem at hockey games across the nation. Connors left the Maritimes at the age of 15 and travelled across Canada, writing songs about the people he met and the places he visited. In the early 1960s, when he was in Timmins at the Maple Leaf Hotel, his career was launched when bartender Gaetan Lepine agreed to give him a drink if he played a few songs. He stayed for a year, performing at the hotel and the CKGB radio station, in addition to recording songs. Connors signed with Dominion Records in 1969, and created his own Boot Label in 1971 with Jury Krytiuk to promote Canadian artists. Famous through the country, The Hockey Song was produced in 1973 and is a simple ballad to honour the game of hockey. Connors retreated from the music scene to his farm in Ballinafad, Ontario, where he died in March 2013. 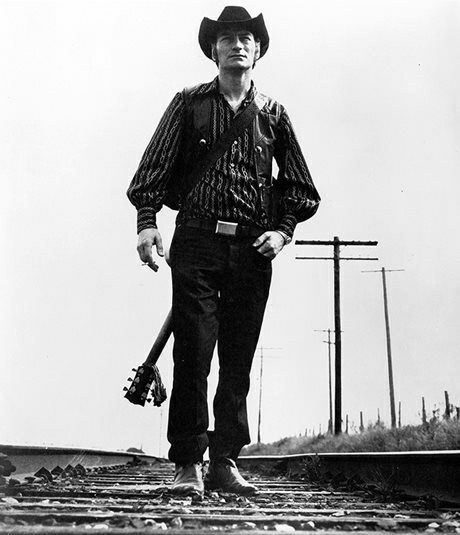 Learn more about Stompin’ Tom on his website. Listen to an interview with Gaetan Lepine, the bartender who discovered Stompin’ Tom, from the CBC Radio archives.